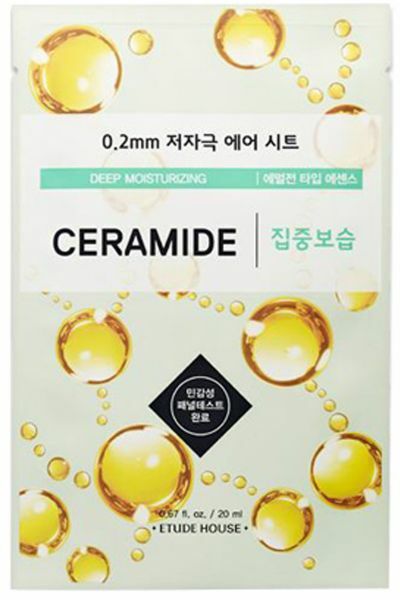 Introducing Etude House'S 0.2 Therapy Air Mask Ceramide, Deep Moisture And Skin Reinforcement. Ceramide Quenches Dry Skin, Giving It The Rich And Deep Moisture It Needs. It Also Helps Strengthen The Skin'S Natural Barrier And Keeps In The Moisture For A Long Time. Contains Ceramide (200 Micrograms). Smooth Absorption And Nutrition. Emulsion Type Essence. Ingredients: Water, Glycereth-26,Dipropylene Glycol, Propanediol, Alcohol, Hydroxyethyl Urea, Butylene Glycol, Glycerin, 1,2-Hexanediol, Aloe Barbadensis Leaf Extract, Sodium Carbomer, Allantoin, Hydroxyethyl Cellulose, Glycyrrhiza Glabra (Licorice) Root Extract, Coptis Japonica Root Extract, Zingiber Officinale (Ginger) Root Extract, Camellia Sinensis Leaf Extract, Dehydroacetic Acid, Sodium Hyaluronate, Disodium Edta, Dipotassium Glycyrrhizate, Polyglyceryl-10 Laurate, Polyglyceryl-10 Myristate, Caprylic/Capric Triglyceride, Boswellia Serrata Gum, Beta-Glucan, Hydrogenated Lecithin, Lavandula Angustifolia (Lavender) Oil, Eucalyptus Globulus Leaf Oil, Geranium Maculatum Oil, Citrus Nobilis (Mandarin Orange) Oil, Citrus Limon (Lemon) Fruit Extract, Pinus Palustris Oil, Phytosteryl/Octyldodecyl Lauroyl Glutamate, Ceramide Np. How To Use: Remove Mask From Pouch And Apply To Face, Placing Mask To Fit Eye And Lip Area. Remove Mask After 10~20 Minutes And Lightly Massage Remaining Solution Into Skin With Hands.